Somewhere on one of my Pinterest browsing days I came across this image and it stuck with me. 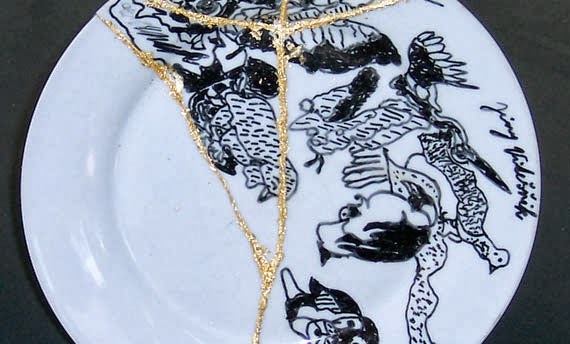 The raised, obvious mending on a broken plate, using gold. Gorgeous. I gave the biggest of the two pieces to a lady at work who does the most intricate pen drawings and asked her to fill the plate with whatever she felt like. 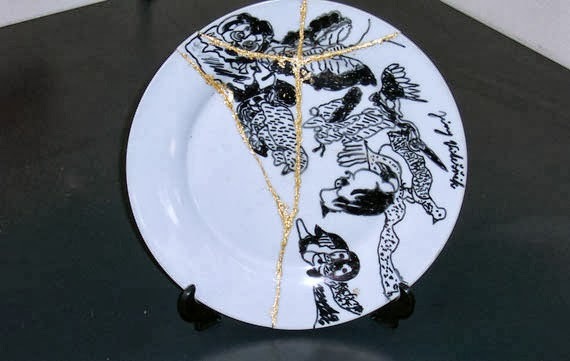 I then took it home and tried to create a similar look without the benefit of a kintsugi repair kit (cause I could find them nowhere on ebay). On the way home I managed to break it into smaller pieces… but thats ok. It still works! 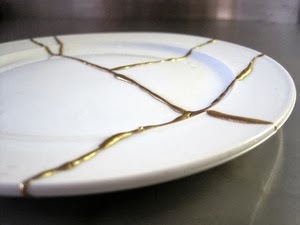 I used some glue I had on hand which said it would bond glass, and when it was tacky I sprinkled it with gold leaf. Its not quite the same, but I still think its a good effect. This is one of the pieces we entered at the Art from Trash competition. Hopefully it will sell. The artist will be thrilled! This entry was posted in Craft, thrifting by zefiart. Bookmark the permalink.